The tour includes the most famous sights of Kazan: Kazan Kremlin, Old Tatar Sloboda, a Tatar village Tugan Avylym in the city center, the oldest mosque Marjani, Kamal theatre , the mysterious lake Kaban, Kazan Millennium Park, Liberty Square, the Kazan University, Kazanka river embankment, offering unique views of the coast of the Kazan Riviera, Peter and Paul Cathedral, the miraculous icon of the Mother of God of Kazan. Sightseeing tour includes a visit to the Kazan Kremlin. Kazan Kremlin – a unique complex of archaeological, historical and architectural monuments that have arisen and the functioning from the city’s founding to the present day.In 2000 the Kazan Kremlin was included in the UNESCO World Cultural and Natural Heritage. Complex objects are managed by the State Historical and Architectural Museum-Reserve “Kazan Kremlin.” You will see the Spassky tower, leaning tower Syuyumbike, government buildings, visit the Kul-Sharif Mosque and the Cathedral of the Annunciation. At 30 km from Kazan on the banks of the lake, in the reserve woods located Raif monastery. Its main shrine – is the miraculous icon of Our Lady of Georgia. The perfect place for visiting the source of living water, and the chapel, where under the guidance of his mentor’s going to serve Vespers and Matins. The monastery complex consists of Cathedral in honor of the Holy Trinity Cathedral, Georgian icon of the Mother of God, Church in honor of the Holy Fathers in Sinai and Raifa Belfry, with the gate church in honor of the Archangel Michael. You will learn about the unique history of the monastery, you can take the healing water and visit the miraculous icon. Sviyazhsk-Island located in the picturesque estuary of Sviyaga river on a hill “High Mountain”. Abundant nature, surrounding shallow, waters of bays and islands attracted people since ancient times. Distance from Kazan quite small, up to the Volga, just over 30 km. Sviyazhsk – it’s historical and cultural gem of the Republic of Tatarstan. The ancient fortress built in Medieval times during the reign of Ivan the Terrible, served as a military outpost in the Volga region and the place of rest and preparation of military units to march on the impregnable fortress of Kazan. After the capture of Kazan Island-hail continued to live and tell their memories of the best and most serious times. Night Kazan leaves a lasting impression. In these few hours you will see another Kazan, the hushed and relaxed, and all the lights illumination of historical buildings. Panorama of the old city in the night lights and reflection in the river Kazanka will not leave anyone indifferent. 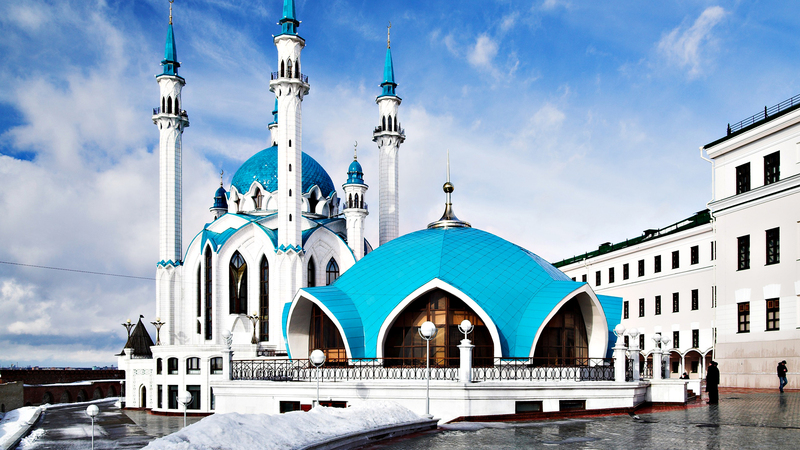 The excursion takes place on such famous places as the Kazan Kremlin, the Old Tatar settlement, Marjani Mosque, Kamal Theatre, Lake Kaban, Millennium Park, a Tatar village Tugan Avylym in the city center, the square of Freedom, the Kazan University, Kazanka river embankment, offering unique views of the coast in the other side of the city and the Kazan Riviera. Bauman street called recently the Kazan Arbat, in view of the fact that since the 1990’s, it became a pedestrian. Walking on it you will see the church and the bell tower of the Epiphany, Chaliapin monument, the building of the National Bank, the Drama Theatre, the royal carriage, a monument to a cat, charming fountains and more. Mysterious Tower of Elabuga “Devil” settlement – witness the tumultuous events of the Middle Ages. Legends, traditions and historical facts associate with the great names of Elabuga from Temir-ak-Saka and Ivan the Terrible to Pugachev and Empress Catherine II, by which the highest decree in 1780, the village Trekhsvyatskoye was transformed into the city Elabuga. Bulgar settlement – a unique sight of Russia. This is all that remains of the Golden Horde, the once great and powerful country in Eastern Europe, (not counting the mosques and mausoleums Gasimov and Syuyumbeki tower in Kazan). Greatest prosperity of the city falls on the line XIII-XIV centuries. Most of preserved architectural monuments are treated to that time.Now there is their active restoration. The Universiade – the second most important international sporting event after the Olympic Games. Our city Kazan is preparing to open its doors to guests and participants of the World Summer Universiade in 2013. For 26 of the sports that are included in the program of the Universiade competitions in 2013, will involve 64 sports facilities, 30 of which are built to the 2013 Summer Universiade. You will see new super modern sports facilities, including Tennis Academy, Palace of Water Sports, a sports complex “Zilant “, Center for Boxing, Field Hockey Centre and other. During the bus tour will have the opportunity to explore the many sports facilities, the Universiade Village, learn the history of the development of mass sports.